There is a mixture of silks in this shawl - some two ply, some single ply, Indian and Chinese and all hand dyed by me. 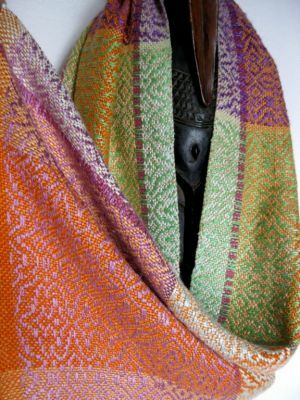 This is a luxurious, quite heavyweight wrap in glorious shades of deep orange, apricot, pale aqua, light and dark purple and bright green, with touches of lemon and dark aqua. I have woven the lovely pattern throughout the piece, using two shuttles, one for the background and the other for the different coloured pattern weft. This has resulted in a beautifully rich fabric, labour intensisve to produce but worth all the effort! It measures 16.5" x 71", 42cm x 180cm and is finished with a simple knotted fringe. I started handweaving after I was given a large 1930's Harris floor loom and that was the beginning of my love affair with weaving!